Property Image. The parking lot is the first thing that customers or visitors see at any building or store . A well marked, and freshly painted parking lot is attractive, striping also helps in all aspects of safety. Striping should direct people around the parking lot in a safe and efficient manner. Properly marked crosswalks, stop bars, and loading-zones will inform users where they should walk. 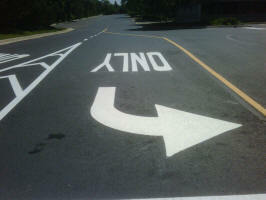 Regardless of how well a lot is painted periodic re-striping is needed to refresh the lines. The cost of this re-striping is much lower than the original job as the layout is already done.